Feng Shui can be confusing to the beginner and quite often, the more you research it in books or on websites, the more confusing it actually becomes. This is because there are many methods or "schools" of feng shui. Some methods are very quick and easy to use, whilst others are more advanced and require knowledge of complex techniques to fully understand. However, all the classical methods originated in China and have been tried and tested over thousands of years ago. We begin with one of the earliest types of feng shui. The oldest documented form of feng shui, Form School is how feng shui was practiced thousands of years ago before the invention of the magnetic compass. These ancient people studied the land, qi flow and the principles of yin and yang. From this, they learnt how best to site their homes, ensuring plentiful harvests and healthy livestock, thereby ensuring their own prosperity. Today using Form School means analysing natural features such as trees, hills, mountains, rivers and lakes. In the urban environment, this also includes other buildings, walls and fences. 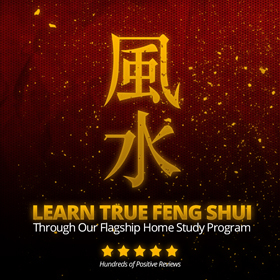 Form School is still relevant today, and particularly important in Flying Star Feng Shui. Although thousands of years old, the term "feng shui" only really came to be known in the west within the last thirty years or so with the introduction of "Black Hat Feng Shui". Generally, this is the first type of feng shui that people come across and use, although many using this system are unaware of its actual name. In an attempt to simplify the complex rules of traditional Chinese Feng Shui, Black Hat uses the Ba Gua, also known as an Energy Map or Bagua Grid, to divide a building into eight "Life Aspirations" or "Stations". It is also common to see the Ba Gua, meaning "Eight Trigrams", incorrectly divided into nine sectors. In its original form, Black Hat feng shui does not use a compass and the main door is always in only one of three sectors. Sometimes, directions are taken into account and incorrectly referred to as being part of "compass" school. The simplicity of this system means that Black Hat feng shui is very popular, however it relies on the power of a positive mind and in particular, the use of decorative "enhancers" or objects that you must place around the home to keep you positive and focused on your goals. If you like these new age accessories and they fit in with your decor, that's fine, but traditionally, Feng Shui cures were simply the correct use of colour, shape and natural materials such as plants and of course, water. Traditional feng shui masters are more interested in the type of qi that enters a site and to do this they use more than just the simple bagua. In addition, a feng shui master will also use Chinese Astrology in conjunction with Feng Shui because using Feng Shui in a building without finding out the energy of the people who actually live or work there, is meaningless. Compass Schools, as the name suggest, use compass bearings and various feng shui calculations, but within this group, there are differences. Methods such as Eight Mansions or Eight House (Ba Zhi) are increasingly popular but very often misunderstood. This system uses the 8 trigrams to designate auspicious and inauspicious sections of a building, but having been greatly simplified, often causes great confusion. Although useful when properly implemented, Eight House does not account for the effect of time on the energy within a building and is therefore not as dynamic as other methods. Flying Star Feng Shui or Xuan Kong Feng Shui is considered one of the most powerful and long lasting methods of feng shui. It uses a Luo Pan or Chinese compass to gain an accurate compass bearing of a building, together with complex calculations that supply specific information about the site. This degree of accuracy ensures the feng shui analysis is not only unique to that building but most importantly, that the effects of time are taken into account. The occupant's birth dates should also be used in conjunction with Flying Star to help identify the relationship between them and the energy pattern of their environment. Attention: Those Seeking The Truth About Feng Shui (And the Adventure Awaiting within Your Home). ﻿All you need to improve your life (and the lives of others) is potentially slipping through your fingers by not taking advantage of the energy already in your home or office. ﻿Your space is a mesocosm of the outside world in the same way that an atom , the smallest building block of matter, is a replica of our own solar system. ﻿By changing one we change the other; that's where you, the microcosm comes in. After all, how many times have you felt better after redecorating your own home or living environment? ﻿Now by learning feng shui you can do this with purpose and read your environment to see the effect it is already having on your life. Furthermore, you can make subtle changes without decorating, to invite the things that you want to happen manifest in your life. More. Practical advice on how to apply traditional Feng Shui cures in your home. Find out how colour is used in Feng Shui according to the Five Elements. Traditional feng shui cures, remedies and enhancements. The ancient trigram symbols that contain great knowledge and wisdom. How to use a western compass to improve the Feng Shui of your home or business. The basic toolkit of Feng Shui, Chinese astrology and Traditional Chinese Medicine. How to apply the Feng Shui Bagua energy map to areas of your home or office. The ultimate explanation of Feng Shui words and terms. The science of Feng Shui explained. Discover exactly why Feng Shui works. Our gallery & analysis of Feng Shui buildings from architects around the world. © Feng Shui Institute. All rights reserved.